Citizens Theatre has been around since The Citizens company was formed way back in 1878. Blessing Glasgow with a wide range of productions, you can expect to be surprised (and often challenged) by shows put on by The Citz. Without doubt, The Citz repertoire can claim world class status. Featuring new writing, they bring on new talents. Add to this a strong line in British and overseas classics, as well as more modern plays, and its easy to see why The Citz has a very strong fan-base indeed. As their name suggests, The Citz 'keeps it real' for all aspects of local life. With this in mind, they have an active touring schedule, and actively engage youngsters in their work. Great news! Finding this page means you can now join our VIP list for Citizens Theatre. Grab your very own web page all about Citizens Theatre. 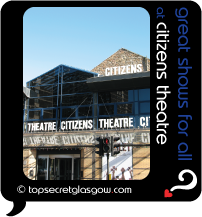 Do you have a special story about Citizens Theatre? A funny experience? A grand occasion? A funky photo? A personal tip? A top secret?